Several friends told me I “had” to read this book, “Become Your Own Matchmaker” by Patti Stanger. I don’t know what it says about me that they think I need literary help in my dating endeavors, but…nonetheless I read it. Turns out, (as you may have guessed), that about 50% of it was stuff I already knew and the other half I disagreed with. (But then, are you surprised?) Really makes me think I need to write a book. Apparently you can be a bestselling author by writing a bunch of common sense relationship advice interspersed with your own unique ideas, even if they’re based in nothing other than your sheer personal opinion. Here are some of the dating rules she made…that I’ve either already broken, fully plan on breaking in the future or just flat out think are dumb. At LEAST half of my dates have come from me initiating communication with a guy online. 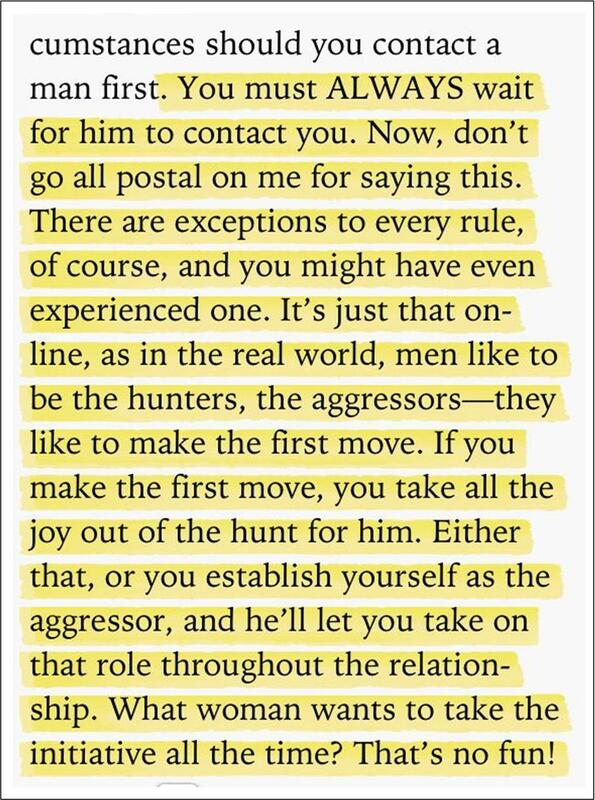 Isn’t the whole point of taking the search to an online venue, that you’re embracing the deliciously postmodern era of dating where men and women can equally initiate contact? I don’t think that by being the first person to say hi (or “wink” or “flirt” or whatever that site’s cheesy equivalent is), I’m giving up my position of femininity or lowering my worthiness of pursuit. I am ALL FOR a man to pursue a woman. I love this idea – always have. 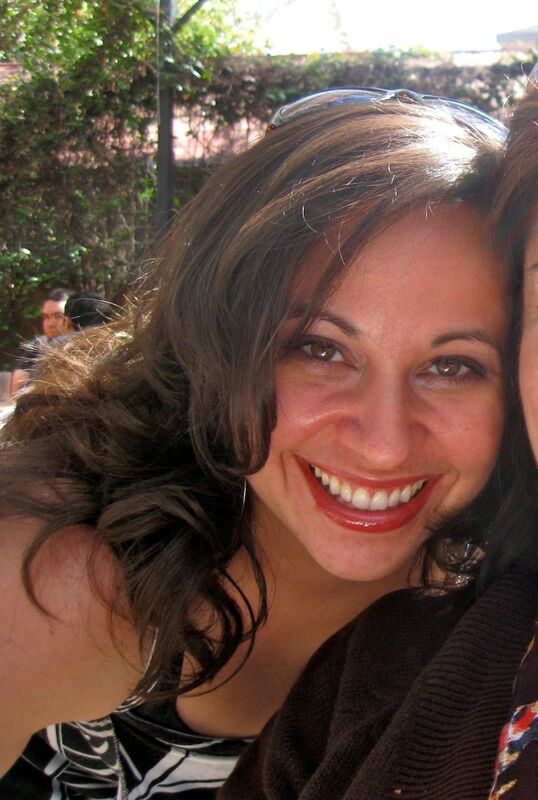 But, if I find a profile of a guy online that piques my curiosity – should I do nothing, hoping that he’ll stumble across mine among the 1,000s out there and contact me? All I want to do is put myself on his radar. If you think about it – this is the virtual equivalent of going to a bar. Just by putting yourself in the same space as a single guy, you’re putting yourself on his map. 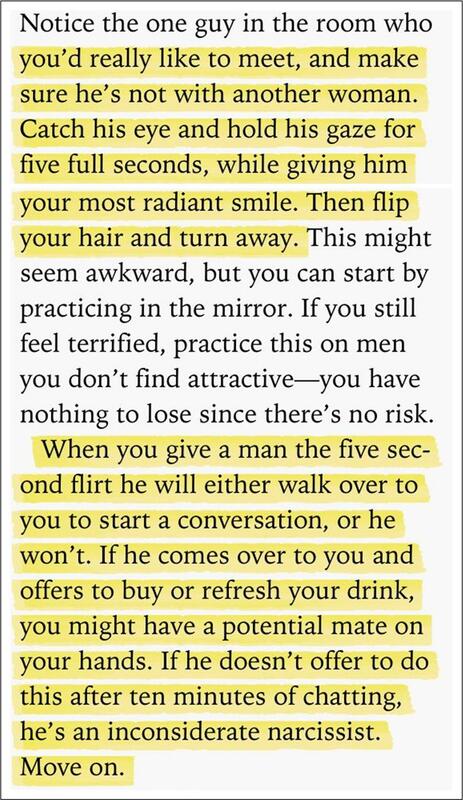 Later she’ll talk about doing a “5 Second Flirt” when you’re out at a mixer/bar/restaurant and then waiting for the guy to ‘bite.’ Isn’t that all I’m doing by saying hi first online? After that, he is free to chase. Nay – invited to! And most quality guys do. – Don’t opt for less than dinner for your first meeting. I ABSOLUTELY disagree with this. 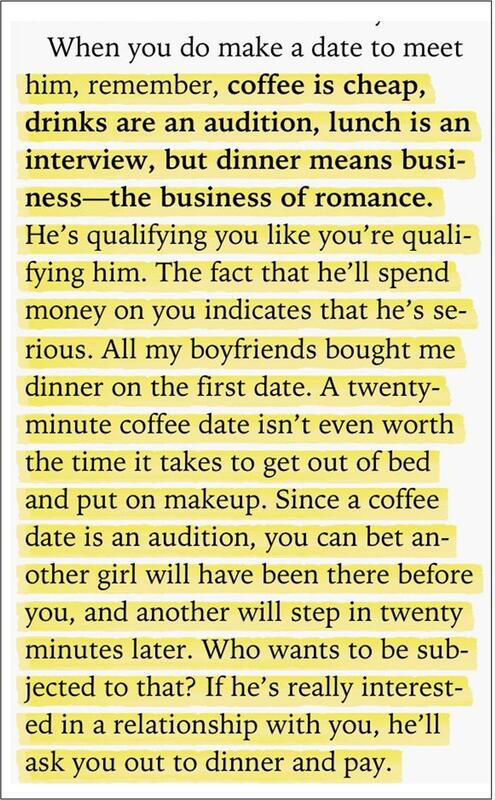 I will NOT go out to dinner with a guy I’ve never met. I’ll do coffee or drinks or maybe lunch. That’s it. I think she’s exactly right about coffee being an audition. But what’s the matter with that? Isn’t that what dating is about? I’m auditioning guys for the role of partner/boyfriend/lover/husband. And they’re doing the same! I am perfectly fine being auditioned. And I don’t mind if another girl was there before me and another is coming afterward. I know what I bring to the table and I’m confident. If he chooses one of them over me, then I’ve lost nothing – we weren’t meant to be anyway since he was obviously looking for someone different for the “part.” Auditioning is EXACTLY what I’m doing. And I’m fine with that. The idea of going out to dinner with someone who I haven’t yet interacted with in person sounds like the first circle of hell. Being trapped for that long without any real map of who this guy is, other than the “on paper” persona he’s created online (which we ALL know is “always 100% true…”) is a huge gamble. What if…(and the following have all happened to me) – he is much more overweight than he indicated? What if he has really bad teeth? What if he has awful breath? What if he makes uber lame jokes and then laughs awkwardly at them? What if he does that uncomfortably long staring thing? What if he answers all your questions with short clipped one-word answers, thereby giving you nothing to work with to create engaging conversation? What if he smells (and not in a good way)? I know that I must sound harsh, but my time is SO limited. Between 2 jobs, 2 children and church and volunteer work, my time to go on dates is precious little. I do not want to waste 2+ hrs on someone who I know within the first few minutes is not going to be a good match. I’d much rather be out 45 minutes and a cup of tea or a beer. That’s an acceptable sacrifice for a flopped audition. This one cracks me up more than any of the others. This is one of her infamous tips. The 5-second flirt. Sounds great, right? Here’s the thing. I tried this. And I’m here to tell you that a true 5 seconds is a friggin’ eternity. I think it’s actually longer than the lifespan of a mayfly…but don’t quote me. I suppose it’s one thing if you’re in a dark bar where there are tons of singles looking for a romantic connection. But, when I imagine this happening in daylight, in line at the prepared foods section at Whole Foods, …it kinda makes me want to have a bag boy walk me to my car… just in case. Before reading this book, I’d already adopted my own version of this idea, which is just to make eye contact with a cute guy and hold it just ever so slightly longer than I’m really comfortable with – just to let him know that it’s not an accident. Then I smile and go back to what I was doing. My method works. Well…it WILL work… someday. 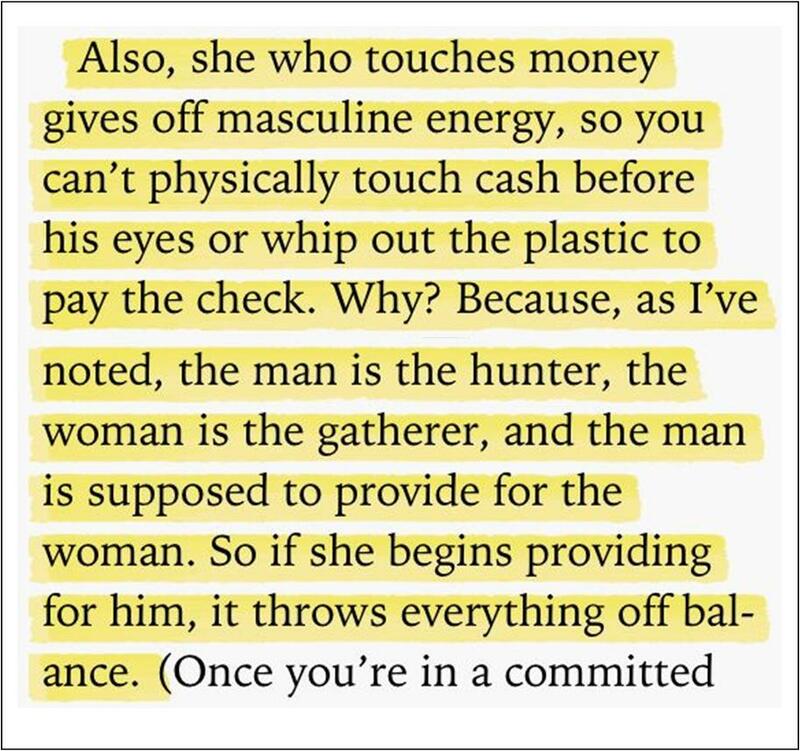 “Masculine energy,” huh? I thought it gave off the “I’m a secure non-gold-digging woman energy.” Guess I was wrong. I agree with the idea that the guy should pay. Maybe it’s being blindly traditional, but I just think it sets a tone of respect and him acknowledging that you/I are worthy of being taken care of. It’s sweet. But – I always sincerely offer to help out when the bill comes. 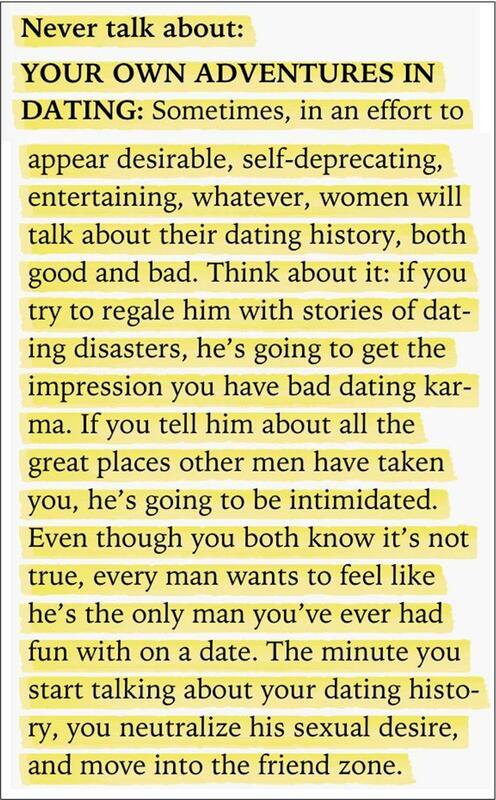 I think this comes, in part, from talking with so many men whose number one complaint is about finding women online who are looking for a wealthy guy to help them out of debt and into a life of opulence. I don’t want him to think I NEED him to pay. So, by offering to pay and then (hopefully), him insisting to, it shows HIM that I’m able to and not a gold-digger, and it shows ME that he is a gentleman. Win-win. Really?? You’re gonna take that away from me? That’s my JAM! – it breeds familiarity by leveling the playing field a bit. I have talked about the online dating scene with all of my dates. It’s an easy go-to topic that’s a shared interest and is entertaining…I think those conversational benefits outweigh the slight possibility that my dating life will intimidate him. I mean…hello – we’re both obviously on the dating scene – that’s how we FOUND each other. I suppose all I need to do now is sit back and wait for some snotty blogger to pick IT apart. It’s the circle of authorship. I’m glad to be a part of it.